This is a RARE California Mobil Oil License Plate TOPPER from 1939... 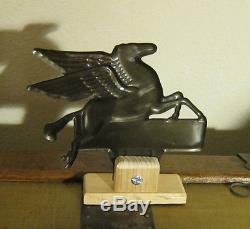 Mounted on a wood stand. Has a bit of surface ware but overall in excellent condition... It would be a hard find in this exceptional condition... 6 1/4" x 6 1/4" across. Thanks for clicking on FrontierFannie. 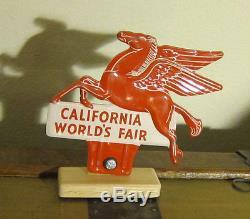 The item "MOBIL Oil California PEGASUS 1939 WORLD'S Fair License Plate TOPPER" is in sale since Wednesday, February 15, 2017. This item is in the category "Collectibles\Transportation\Automobilia\License Plates\US\ California". The seller is "frontierfannie" and is located in University Place, Washington. This item can be shipped to United States.